HONOLULU – The U.S. Environmental Protection Agency recognized Hawai‘i Volcanoes National Park with the EPA’s Federal Green Challenge Regional Overall Achievement award as part of its efforts to encourage federal departments to reduce their environmental footprints through sustainable practices. Hawai‘i Volcanoes National Park, located on Hawai‘i Island is one of the most biologically diverse landscapes in the world. Located nearly 2,500 miles from the nearest continental land mass, the park stretches from the summit of Mauna Loa at 13,677 feet down to sea level. It encompasses two of the world’s most active volcanoes, and attracts more than 1.6 million visitors a year. “We are extremely honored to receive this level of recognition for our climate-friendly efforts,” said Park Superintendent Cindy Orlando. “Our staff is dedicated to implementing environmentally responsible practices, and we encourage our visitors and park partners to do the same,” she said. The park had top regional achievements in the Federal Green Challenge Waste and Purchasing target areas, increasing recycling by 167 percent to achieve an overall recycling rate of 76 percent, while decreasing copy paper purchases by 89 percent. In addition, 95 percent of its cleaning products met Environmental Preferable Purchasing criteria. Not only does Hawai’i Volcanoes National Park walk their talk behind the scenes, but park employees reach out to the community and visitors throughout the year through programs, exhibits and presentations on the values and importance of being climate friendly and sustainable. 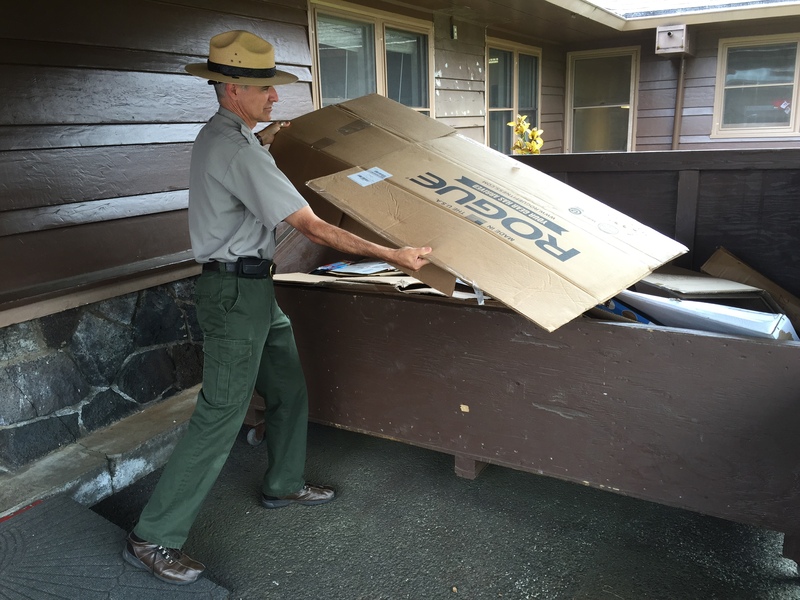 The park actively works to reduce their environmental footprint in all six Federal Green Challenge target areas: energy, water, waste, electronics, purchasing and transportation. In addition, the park’s Visitor Emergency Operations Center, which opened in 2011, earned a LEED (Leadership in Energy and Environmental Design) Platinum certification by the U.S. Green Building Council – and is currently the only federal building in Hawai‘i to receive LEED Platinum certification. The 4,896-square-foot building is powered by photovoltaic panels and is constructed from mostly recycled or reused materials. Hawaii Volcanoes National Park has made more great strides in conserving energy. Park rangers ride electrically powered “Eco Bikes” to their programs along the Kīlauea summit, saving fossil fuels and parking spaces. The Kīlauea Visitor Center features special yellow LED lighting to conserve energy and keep night skies dark. Solar panels generate renewable energy, and electric and alternative fuel vehicles further reduce energy and transportation-related emissions. The Federal Green Challenge is a national effort challenging federal agencies to lead by example in reducing the Federal Government’s environmental impacts. In 2014, more than 400 participating facilities, representing nearly 1.3 million federal employees, “walked the talk” in various target areas and reduced their environmental footprint, which in many cases also resulted in significant cost savings. In EPA’s Pacific Southwest Region, $3,486,990 was saved through reductions in energy, purchasing, transportation and waste.